Abhijit Banerjee, Business Head- Industrial Sales, IFB Industries: Although this is the first time, we’ve had our footprint in Laundrex India and have had very good footfall. We’ve got a mixed bag of enquiries lined up, some already sealed over here itself. Ayush Khanijo, CEO-Orgaearth Cleansol: We are based in North India, so this Bengaluru Expo is great for us to tap the South market, which we feel has huge potential. It’s a great platform to showcase our products, to network within the industry and to generate good business from the market. 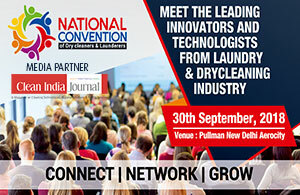 Choleshwar Ratne, MD-A2Z Laundry Solutions: The response has been huge. The footfall was wonderful, and we had enthusiastic visitors. Sometimes, we had to keep our stall open till 7pm on the request of visitors, some of whom came from as far away as Guwahati! Three days a year are not enough, we need more! David Chadima, International Sales Manager, Dexter Laundry: We’ve been able to talk to almost everyone who stopped by our booth, answer all their questions, and share some production literature as well. We’ve had serious customers, and look forward to working with them in the future. Dilip Param, CEO-Dhobiwala.com: It’s been an exciting three days! This industry is growing rapidly, which is experienced by the sheer number of people who have visited us. It’s been a privilege to exhibit here. Srinivas Ramakrishna, CEODhobilocker: We got a lot of support from the organising team even before we began setting up our stall. They were very co-operative, helped us with logistics, and ensured we were comfortable throughout the show. Had I missed this show, what I achieved here, I would not have been able to achieve even if I had worked the whole year round.